National Maternity Voices associate member Paul Webster on why Dads matter too in the maternity experience. Becoming a parent is a moment of incredible change in all aspects of life; mentally, physically, socially and professionally. Before baby is even born, getting yourself ready for the impending arrival seems like a never ending to-do list. The old saying that preparation is key, brings a flurry of books and articles, advice from friends and family, and purchasing all the gizmos and gadgets that may help make life as a new parent, that little bit easier. The care that a new mum receives is vital and the support antenatally and postnatally, can bring increased confidence when learning the parenting ropes. Regular midwife appointments, antenatal classes and baby groups, all aid in building a network of communication, of peer connection, of togetherness. The picture for fathers can look very different. Society tells men how to be a dad. What a dad should do, how a dad should be, the importance of a dad. All these answers are learnt through relationships with their own father figures, with other dads in their peer groups, and through various media outlets. Advertising for baby items are predominantly promoted to a female audience and promote a ‘mother knows best’ viewpoint, leaving men entirely absent. When the mothers receive regular follow ups and are monitored for anything out of the ordinary, a majority of fathers are missed due to work commitments and unavailability, or simply not asked. The lack of male presence at baby groups, where early bonding with other parents is a possibility, also means the role of a modern father is lost and they are isolated further. The need for more education, support and communication is required not only for both parents, but also for society as a whole, to help them understand that parenting is a partnership and both have the same responsibilities and are just as important as each other. Education is especially required around emotional support and how the shift in fatherly roles can lead to a need for increased, and more diverse, mental health services. An incredibly positive step is that NHSE announced at the end of 2018, that mental health checks are to become accessible for new fathers, as well as mothers, meaning a family level of mental health care (https://metro.co.uk/2018/12/03/new-dads-to-be-offered-mental-health-checks-and-treatment-on-the-nhs-8203044/). Post natal depression is a highly documented issue across mothers and regular access to support networks are widely available. However, paternal depression and anxiety are much less publicised, but are increasingly affecting new fathers as they take a more active parenting role. A baby can be challenging for both parents and there is recognition that mental health issues are also experienced by fathers. Fatherhood brings its own set of challenges, including financial and lifestyle shifts, that contribute to a drop in mood. According to a study by the National Childbirth Trust, more than 38% new fathers (1 in 3) have worries about their mental health. The NCT also states that general studies have shown that 1 in 10 dads has depression and they appear more likely to suffer from depression three to six months after their baby is born. Becoming a father can be made increasingly difficult if there is a lack of available support networks, both personally and from the wider community. This can contribute to the thought process that the feelings are a phase and simply coming to terms with the lifestyle change that fatherhood brings. Feeling very low, or despondent, that life is a long, grey tunnel, and that there is no hope. Feeling tired and very lethargic, or even quite numb. Not wanting to do anything or take an interest in the outside world. Each dad will experience paternal depression differently and being aware of your feelings and knowing when things change, is indication that you may want to seek further advice. A key hurdle to gaining support is that some men can find it embarrassing or weak to share their emotions and open up. If you find that you have feelings of anxiety or low mood that continue over a longer period, visiting your GP can aid in signposting to relevant support services. PANDAS Dads offers specific information for men experiencing paternal depression, via its Facebook page. The Birth Trauma Association has information and support for partners of someone who’s experienced a difficult birth. The Fatherhood Institute works on policy and research to support fathers. Light Sheffield is a Sheffield charity that offers support through pre and postnatal mental health issues. They provide support to mums and families, through counselling, peer support or via their online forum. From Dads to Dads is a website created by Sheffield charity Forging Families, as an informative resource for fathers. Dad Matters, is a Greater Manchester based group, run by Kieran Anders. This is a volunteer group started to include and involve dads in the care of their baby. Paternal mental health is an issue that requires support, through healthcare services and within the community, but also fathers feeling this way need to feel free to open up to friends, or their partners, without fear of appearing weak. Although there are more available points of contact for dads to reach out, much more can be done within society to give them a place and listen to their voice. Therefore, by highlighting the importance of paternal mental health and by making valuable suggestions, dads can work alongside their MVP and bring concerns or constructive feedback to the forefront of the maternity conversation. There is strength in numbers and together, fathers teamed with an MVP, can bring about real change and give their voice an increased volume. 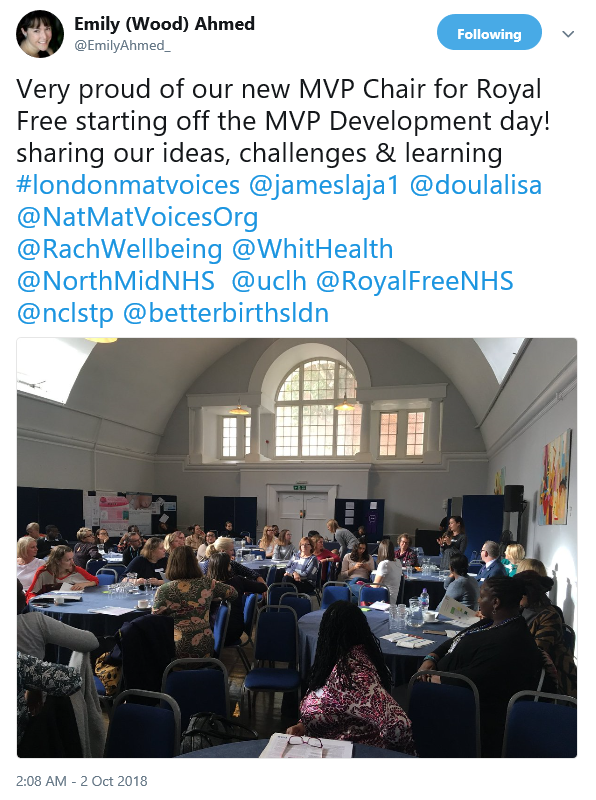 On October 2, around 100 delegates from the 21 Maternity Voices Partnerships (MVP) across the five Local Maternity Systems in London came together at the second annual London MVP development day to share learning and triumphs, reflect on where they are and where they want to be. To network and support the chairs of MVPs, face to face and via social media. We also outlined the aims of the day; really encouraging people to reach out, network with each other and have those important conversations, which are sometimes challenging, about where we really are in terms of working relationships and what needs to be done to move forward. Delegates were invited to write any questions that sprung to mind on a ‘park it’ sheet at the back of the room. 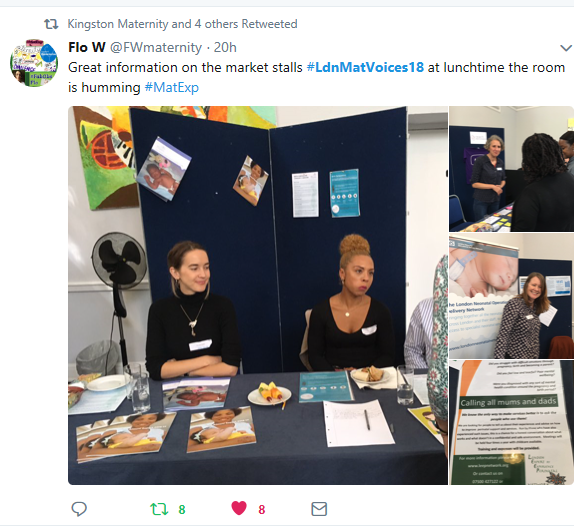 Next it was the turn of Roz Webb, chair of the Whittington MVP, and Lisa Ramsey, service user voice policy manager at the Maternity Transformation Programme, to showcase 15 Steps for Maternity and the Whittington’s experience of piloting this multidisciplinary toolkit. Roz outlined the challenges but also the fact that spending a whole day together really helped unite the group, which included commissioners, midwives, patient experience leads and service users. 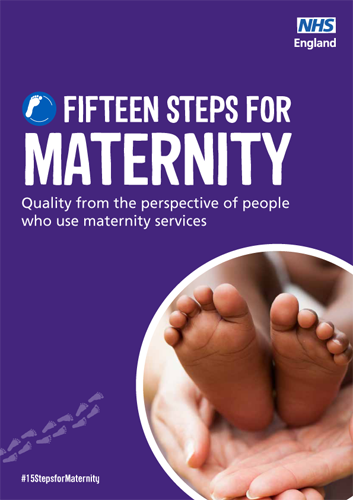 There is much more about the 15 Steps toolkit and some case studies on the National Maternity Voices website. After a brief coffee it was time for a series of interactive seminars. The seminar topics were based on feedback from London MVP chairs about what they would like more support with. To ease logistics, delegates were split into their LMS groups and each of the seminar presenters moved from one room to the next to deliver their workshops. While it did give the impression of speed-dating somewhat, it was much easier having three people move than 100! 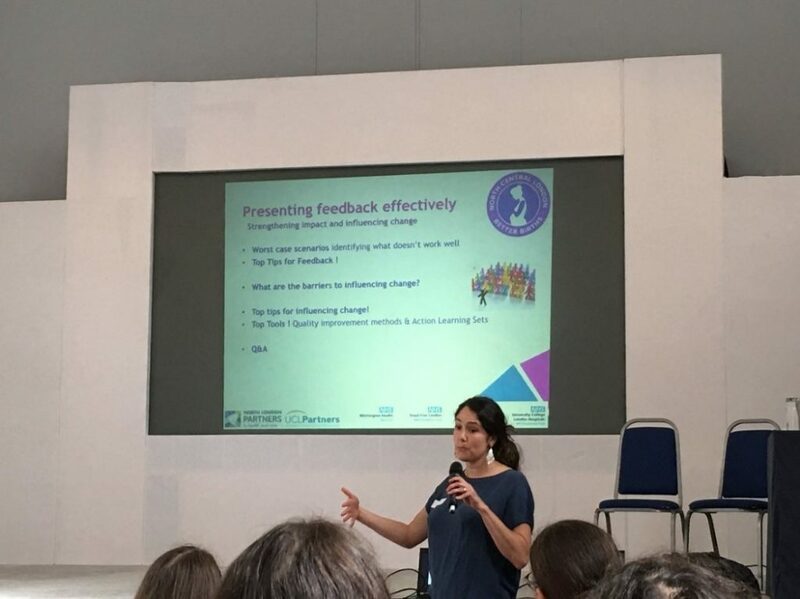 Emily Ahmed from Better Births North Central London gave a fantastic workshop on presenting feedback effectively, what some of the barriers might be to influencing change, and what to do about them. She asked us to imagine a time when we have seen feedback used ineffectively and suggested that doing the opposite easily generates a ‘top tip’. Emily also pointed out that we can be much more receptive to criticism if we receive some positive feedback first. P – what is your purpose? A – who is your audience? C – what is your community? K – know your limits (and then stretch them if you can). Finally, Ceri Durham from Social Action for Health led a discussion about how to reach out to vulnerable groups and how to attract new members to an MVP. There was a really good discussion about the danger of using the term ‘vulnerable’ and a realisation that what women want and need is the same irrespective of their background: it boils down to safe and personalised care. Ceri emphasised the importance of thinking through what will work for local women and local staff, each MVP will be different. She invited us to get out & think through who is missing in terms of membership e.g. obstetricians in contrast to who is missing in terms of voice e.g. partners. After an hour and a half of these back to back seminars, it was time for the delegates (and seminar presenters!) to have a well-earned break and a bit of time to reflect on the messages they had heard in the morning. 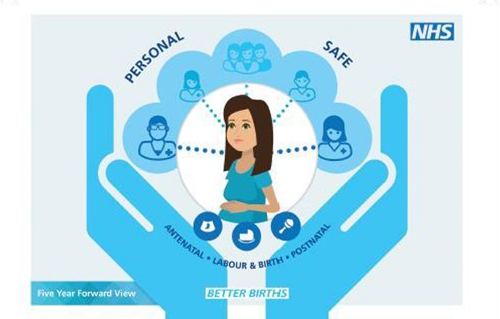 the midwifery unit standards with the Midwifery Unit Network, which networks and supports midwifery units throughout the UK. the REACH pregnancy programme, which is behind the group antenatal care project Pregnancy Circles. London neonatal operational delivery network (ODN), which networks and links clinicians, professionals and parents across the 27 neonatal or special care baby units in London. Cocoon Family support, a charity providing support for women and families in London affected by postnatal depression. The afternoon session was an opportunity for each delegate to get into their own Local Maternity System (LMS) and have some dedicated time to talk about the challenges and opportunities of working together at an LMS level. Maternity Voices Partnerships differ from their predecessors, Maternity Service Liaison Committees (MSLCs) as they also have this strategic role on the Local Maternity System board, as set out in chapter 4 of the Better Births resource pack. Given the wide variety in maturity of MVPs across London, some LMS boards have more service user engagement on their boards than others. There was also opportunity to use a Values and Manifesto tool from https://www.iriss.org.uk/resources/tools/co-production-project-planner to formulate some shared principles for working together and a rogues gallery to learn more about each other and promote collaborative working. At the end of the day, each Local Maternity System group was asked to feedback one key learning that they would take away from the group. 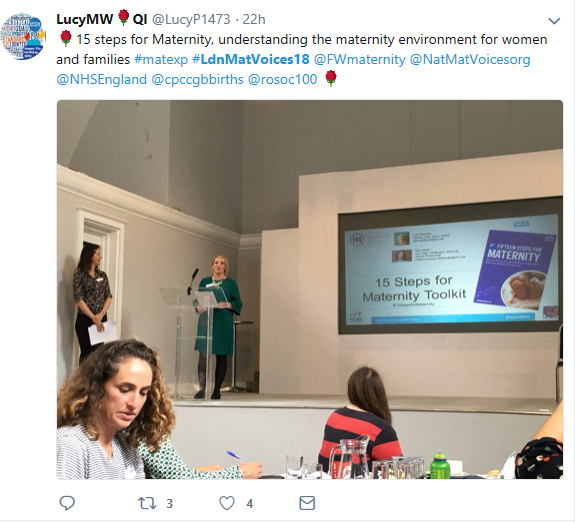 There were some great action points, including using the 15 Steps for Maternity Toolkit and finding a way of ensuring that MVPs have a voice at LMS level. A few questions and issues emerged from the ‘park it’ board. How do MVPs secure funding? Who pays? The Better Births resource pack states: ‘The maternity commissioner is responsible for facilitating and organising any agreed funding’. (p.18) This means it is the responsibility of the Clinical Commissioning Groups to ensure MVPs are adequately resourced. Is there a network for chairs of MVPs? YES! There is a multidisciplinary London MVP network Facebook group and a national MVP chairs peer support Facebook group. 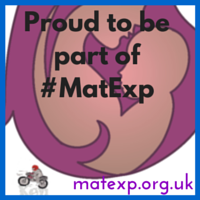 There is also a multidisciplinary National Maternity Voices Facebook group. There is also an opportunity for London chairs to meet face-to-face quarterly. Some have also created their own Local Maternity System networks. 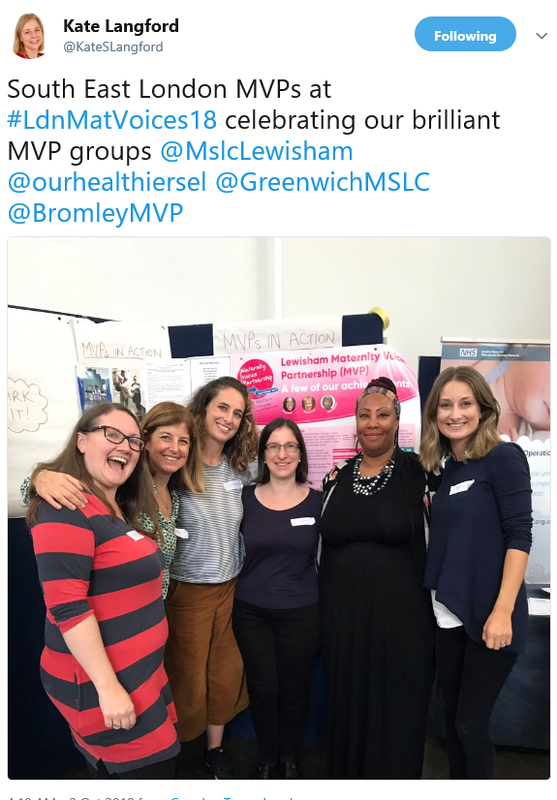 This request for further resources to support chairs is one that has been heard from various sources and requires further collaborative work from the London Clinical Network, the London MVP strategic group and National Maternity Voices. Watch this space! The day finished with a chance for people to continue those important conversations and celebrate with each other. As people left, the buzz of chat and comments overheard suggested that they were feeling energised, supported and had relished the opportunity to come together. 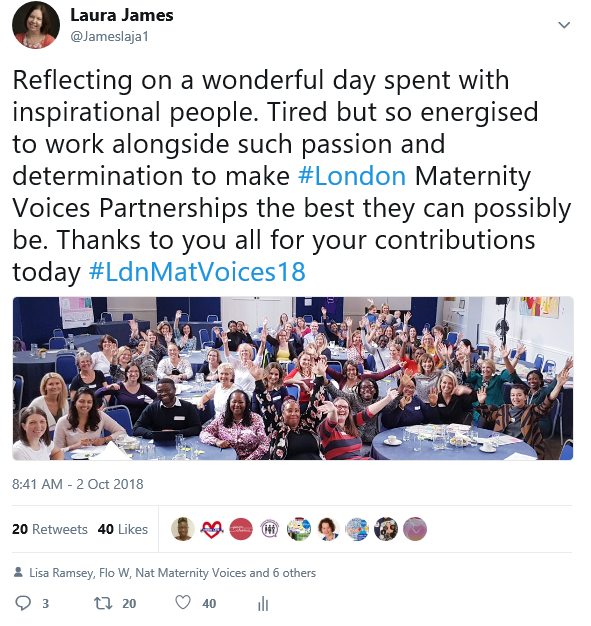 I think we can safely say that #LdnMatVoices18 was a great success. 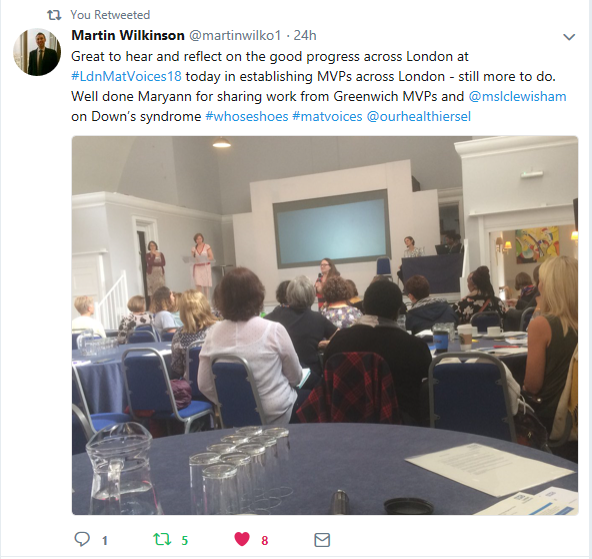 We’re already looking forward to #LdnMatVoices19!